The Transversus abdominis, Rectus abdominis, and Pyramidalis. Thoracoabdominal nn. (T6-T11), Subcostal n. (T12), iliohypogastric nerve (L1), and ilioinguinal nerve (L1). The transverse abdominal muscle (TVA), also known as the transverse abdominis, transversalis muscle and transversus abdominis muscle, is a muscle layer of the anterior and lateral (front and side) abdominal wall which is deep to (layered below) the internal oblique muscle. It is thought by most fitness instructors to be a significant component of the core. The transverse abdominal, so called for the direction of its fibers, is the innermost of the flat muscles of the abdomen, being placed immediately beneath the internal oblique muscle. 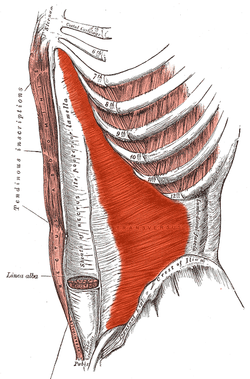 Throughout the rest of its extent the aponeurosis passes horizontally to the middle line, and is inserted into the linea alba; its upper three-fourths lie behind the rectus muscle and blend with the posterior lamella of the aponeurosis of the internal oblique; its lower fourth is in front of the rectus abdominis. The transverse abdominal is innervated by the lower intercostal nerves (thoracoabdominal, nerve roots T7-T11), as well as the iliohypogastric nerve and the ilioinguinal nerve. The transverse abdominal helps to compress the ribs and viscera, providing thoracic and pelvic stability. This is explained further here. The transverse abdominal also helps a pregnant woman to deliver her child. Without a stable spine, one aided by proper contraction of the TVA, the nervous system fails to recruit the muscles in the extremities efficiently, and functional movements cannot be properly performed. The transverse abdominal and the segmental stabilizers (e.g. the multifidi) of the spine have evolved to work in tandem. While it is true that the TVA is vital to back and core health, the muscle also has the effect of pulling in what would otherwise be a protruding abdomen (hence its nickname, the “corset muscle”). Training the rectus abdominis muscles alone will not and can not give one a "flat" belly; this effect is achieved only through training the TVA. Thus to the extent that traditional abdominal exercises (e.g. crunches) or more advanced abdominal exercises tend to "flatten" the belly, this is owed to the tangential training of the TVA inherent in such exercises. Recently the transverse abdominal has become the subject of debate between Biokineticists, kinesiologists, strength trainers, and physical therapists. The two positions on the muscle are (1) that the muscle is effective and capable of bracing the human core during extremely heavy lifts and (2) that it is not. Specifically, one recent systematic review has found that the baseline dysfunction of TVA cannot predict the clinical outcomes of low back pain. Similarly, another systematic review has revealed that the changes in TVA function or morphology after different nonsurgical treatments are unrelated to the improvement of pain intensity or low back pain related-disability. These findings have challenged the traditional emphasis of using TVA-targeted intervention to treat low back pain. The most well known method of strengthening the TVA is the vacuum exercise. The TVA also (involuntarily) contracts during many lifts; it is the body's natural weight-lifting belt, stabilizing the spine and pelvis during lifting movements. It has been estimated that the contraction of the TVA and other muscles reduces the vertical pressure on the intervertebral discs by as much as 40%. Failure to engage the TVA during higher intensity lifts is dangerous and encourages injury to the spine. The TVA acts as a girdle or corset by creating hoop tension around the midsection. Posterior surface of sternum and costal cartilages, showing Transversus thoracis. The interfoveolar ligament, seen from in front. Diagram of sheath of Rectus. Diagram of a transverse section through the anterior abdomina wall, below the linea semicircularis. The abdominal aorta and its branches. ^ Aruin, Alexanders; Latash, Markl (1995). "Directional specificity of postural muscles in feed-forward postural reactions during fast voluntary arm movements". Experimental Brain Research. 103 (2): 323–32. doi:10.1007/BF00231718. PMID 7789439. ^ Dart, R.A. (March 1947). "The Double-Spiral Arrangement Of The Voluntary Musculature In The Human Body". Surgeons' Hall Journal. 10 (2). ^ Wong, Arnold Y.L; Parent, Eric C; Funabashi, Martha; Stanton, Tasha R; Kawchuk, Gregory N (2013). "Do various baseline characteristics of transversus abdominis and lumbar multifidus predict clinical outcomes in nonspecific low back pain? A systematic review". Pain. 154 (12): 2589–602. doi:10.1016/j.pain.2013.07.010. PMID 23867731. ^ Wong, Arnold Y.L; Parent, Eric C; Funabashi, Martha; Kawchuk, Gregory N (2014). "Do Changes in Transversus Abdominis and Lumbar Multifidus During Conservative Treatment Explain Changes in Clinical Outcomes Related to Nonspecific Low Back Pain? A Systematic Review". The Journal of Pain. 15 (4): 377.e1–35. doi:10.1016/j.jpain.2013.10.008. PMID 24184573. ^ Hodges, Paul W; Richardson, Carolyn A (1997). "Contraction of the Abdominal Muscles Associated with Movement of the Lower Limb". Physical Therapy. 77 (2): 132–42, discussion 142–4. doi:10.1093/ptj/77.2.132. PMID 9037214. Anatomy figure: 35:07-04 at Human Anatomy Online, SUNY Downstate Medical Center - "Incision and reflection of the internal abdominal oblique muscle." Anatomy photo:35:17-0100 at the SUNY Downstate Medical Center - "Anterior Abdominal Wall: The Transversus Abdominis Muscle"
Anatomy figure: 40:07-06 at Human Anatomy Online, SUNY Downstate Medical Center - "Muscles and nerves of the posterior abdominal wall." This page was last edited on 13 February 2019, at 10:41 (UTC).